Dissatisfied with your current apron services? 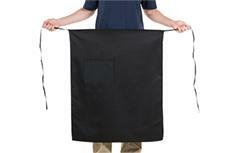 Need better-looking aprons than your average bulk purchase? Getting swamped with all the maintenance and upkeep of your restaurant’s apparel? Worry no more – Dust-Tex’s apron services has got you covered. Get full-scale coverage for your employee uniforms with our selection of bib aprons that protects from the torso down to the lower extremities. Made with top-notch material, our bib aprons are as great looking as they are multifunctional, making them perfect for both back- and front-of-the-house purposes. Get all the stain and spill protection you need while creating a classy, elevated look for your employee uniforms. 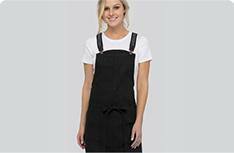 With thin waist straps for a clean, sleek look and additional functional pockets, Dust-Tex bistro aprons are all you need to add some style to your restaurant uniforms. 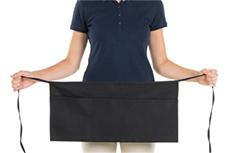 Waist aprons are the perfect apparel addition for your on-the-go waitstaff. They are just the right size for stain protection and added functionality with large utility pockets. Dust-Tex is Oahu’s local authority when it comes to restaurant linens. We are your best source for the best quality linens specialized for use in the food service industry. Our selection of aprons has been carefully handpicked to ensure that each item comes with the highest quality in both material and construction. Dust-Tex also uses state-of-the-art linen cleaning technology to make sure that your linens are always clean and ready to impress your diners. Our expertise and over thirty years of experience in restaurant linen services will bring you the efficiency and linen results that you need and deserve. Get the best in apron services and more with Dust-Tex Services today! Call 808-842-4811 to get started or to learn more about our services!